France has nearly 1,100 soldiers deployed as part of its mission in support of the Iraqi government and its fight against ISIS. To back those soldiers, the country’s military is planning to work from an airbase in nearby Jordan. Of course, in today’s environment, any airbase needs some protection from airborne threats, and in this case, that means specialized squadrons of ground troops to defend against drones. The news of this squadron comes from a short release by the Ministry of the Armed Forces, and it could hardly be more timely. Throughout July and August 2018, insurgent-launched drones attacked a Russian airbase in Syria. While Russia has yet to report any casualties or damage, the pure persistence of the attacks requires some form of interception. But traditional anti-air defenses are either overkill or not well suited to the task at hand. So, what to do? France has a new idea. The country’s anti-drone air defense force is training with a rifle-shaped antenna that can jam the remote control signals of a drone. The jammer-wielding soldiers are paired with other shotgun-armed squad members, whose shotguns fire specialized shells. (As to how those shells are specialized, the Ministry doesn’t say, but there is at least one counter-drone system which fires shotgun shells that release nets on the target). Rifle-shaped jamming devices are more common in the counter-drone world, and the United States had adopted them to such a degree that even the National Guard trains with drone-jammer rifles. But French fighters in Jordan are likely to face the same limitations Russia’s counter-drone efforts faces in Syria. Drones are hard to detect at range by any means except specialized radar, and when in easy detection range for infrared binoculars or telemetry sensors, the drone is likely close enough to pose a threat unless it is stopped immediately. ISIS also has years of experience in building drones from scraps and parts ordered online, as well as adapting existing commercial drones into grenade dropping machines. It was a joint Kurdish-French EOD team that first encountered an ISIS drone booby-trapped to explode in 2016, an incident that killed two members of the Kurdish Peshmerga and injured two French paratroopers. 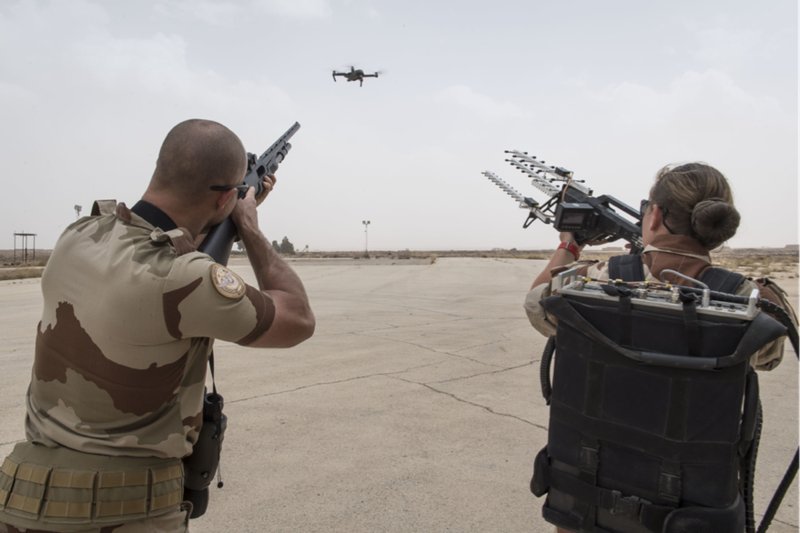 The French military appears to be tackling the threat head-on, proactively training for drone interception. The counter-drone soldiers even have their own drone to scout around the base when need be, one more set of unblinking robotic eyes ready to warn of any danger buzzing about nearby.